EVERETT, Wash. (AP) – Nathan Chen ran away with the Skate America men’s title Saturday. Skating to “Land of All” by Woodkid, the young American star had a clean and polished routine from the start, from his triple loop through the triple lutz. Chen earned a standing ovation from the crowd after his free skate, which earned 189.99 points on the day and 280.57 total for the event. Perhaps most impressively, given that he won the competition by more than 41 points, Chen described his routine as “watered down” as he eases into the new Grand Prix campaign. The 19-year-old Salt Lake City skater was the obvious fan favorite. Banners featuring his photo hung from railings, and his name was held up on posters throughout the audience. 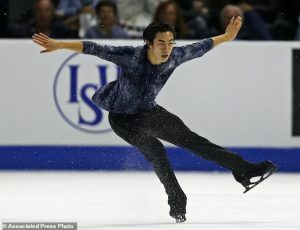 The only challenger who drew close to as loud of cheers was United States teammate Vincent Zhou, who finished in fifth place but had the third-highest score of the day with 149.37. 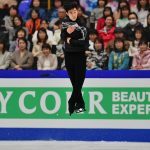 Chen is seeking to build upon a standout 2017, during which he won the World Championships, a second-straight national title as well as triumphed at the most recent Grand Prix final. Japanese skaters dominated the women’s short program. Sakoto Miyahara finished in first place with 73.86 points, Kaori Sakamoto in second with 71.29 and Marin Honda in fourth with 62.74. Reigning national champion Bradie Tennell came in fifth to lead the American contingent, followed by Megan Wessenberg in sixth and Starr Andrews in ninth.